Venus Dress https://www.review-australia.com/au/venus-dress-midnight/RE19DR161.REBLK030.html You'll be the style star of the show in the Venus Dress. Modern with a touch of classic glamour, the beauty of this cocktail dress is in its simplicity. The sleeveless fit and flare style is crafted with a fine mesh outer layer studded with mini sparkling crystals in a chic swirl pattern. The dress has a midi length hem and a concealed back zipper. 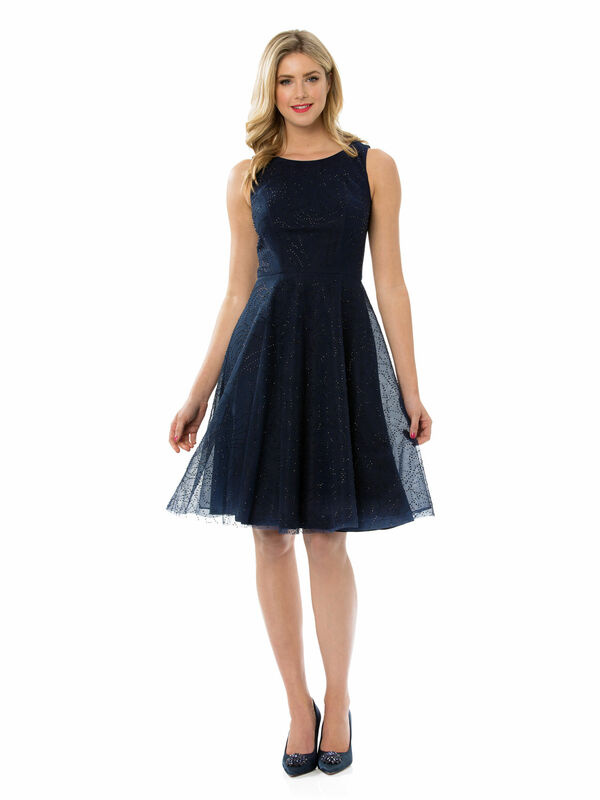 You'll be the style star of the show in the Venus Dress. Modern with a touch of classic glamour, the beauty of this cocktail dress is in its simplicity. The sleeveless fit and flare style is crafted with a fine mesh outer layer studded with mini sparkling crystals in a chic swirl pattern. The dress has a midi length hem and a concealed back zipper. Venus Dress is rated 4.8 out of 5 by 52. Rated 5 out of 5 by Lisa Jane from Amazing I brought this for a couple of formal evening events and absolutely love it. 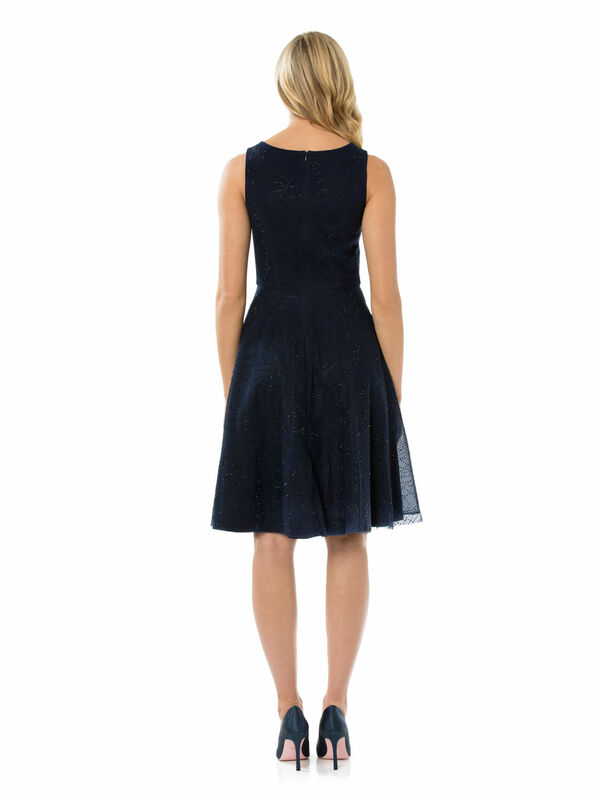 The sparkles add a little something to the navy background; I felt like Cinderella at the first formal evening when I wore it. I’m in between on the sizing - size 12 is a bit big in the torso, but the size 10 is quite uncomfortable under the arms, so went with a size 12 to be comfortable. It will be great in winter with a cropped jacket, and it travels well i a suitcase within a suit bag. I will be getting lots of wear out of it for years to come. Rated 5 out of 5 by venus from Very flattering regardless what shape. Smart. What l love about ALLthe dresses from review is that make me feel beautiful. Being on chemo, a woman (l did) loses her confidence and all people see is the cancer. I put on my beautiful dress and l feel like Venus. The dress is so breathtakingly beautiful and sparkly it is the star of the show no matter who is wearing it. I have bought many dress from review and have always been complimented. Rated 5 out of 5 by Mellie6 from Perfect Christmas party dress I purchased this dress online after trying a different size on in store that was too tight on the bust. So i ordered the next size up and it fits beautifully. Perfect Christmas party dress or New Years Eve outfit. Very glamorous and gorgeous material. Very happy with my decision to buy. Rated 2 out of 5 by YenL from A tad uncomfortable throughout the whole night I love the look of the dress but it was really prickly inside which made it an uncomfortable night. I believe in looks and comfort and unfortunately Review only delivered the looks this time. Disappointing that the finishing wasn't up to the quality I expected on a $330 dress! Rated 5 out of 5 by RJorm25 from Perfect for a more formal event I bought this dress to wear to a wedding and it suited the occasion perfectly. Very comfortable, classy, a little bit sparkly and just dressy enough without being over the top. Great with a silky scarf for colder evenings.